Corporate Politics for Project Managers 101 | Dale Myers' Blog: Think. Plan. Act. Repeat. Project Managers are usually not very good at playing corporate politics. Sure, most are skilled at managing project sponsors and cross functional teams. The best are nimble at navigating complex organizational structures – but, project managers are usually not political beasts. Rather they are doers that like the action of delivering tangible results, things that have value. For them, playing politics is a form of slow, soul sucking torture where logic, discipline, transparency and loyalty are replaced by deceit, secrecy and subterfuge. So, it’s important that Project Managers understand corporate politics, can see the warning signs of danger, and can position themselves to survive in politically charged environments. The biggest mistake one can make is to assume that organizational politics don’t exist. They do – and here’s what you need to know. “Good” politics is about working the system to achieve positive results and helping to meet or exceed business objectives (i.e. profit, growth). It’s about maintaining relationships and getting results at the same time. “Good” politics is about finding “win-win” solutions. Even more succinctly, “effective politics is about reaching mature compromises”. “Bad” politics is when someone works the system to make themselves look good at the expense of others. Typically, “bad” politics are about winning at all costs. It’s about abusing power systems to impose your will on others. “Bad” politics usually result in “win-lose” situations. They can be highly demotivating, destructive – and dangerous to all involved. As you can guess, these are traits of individuals who practice “bad” politics. Their gains typically come at the expense of someone else. Can you think of those in your organization that display some of these traits? I’m sure you can. So, given that office politics are present in most organizations, they can be destructive, and we even know some people who practice them; what should we do? Actively manage your reputation. It’s ok to talk about your successes and to self-promote in a positive way. Someone has to shine – it might as well be you. But, also promote your team and/or the people around you who helped with the success. And, if someone engages in negative talk about you, your team or your accomplishments, confront them with facts. Do not let negative talk fester – address it quickly. Keep your options open / Don’t take sides. Try not to fall into one of the existing power blocks. Choosing from amongst the existing sides often limits your options going forward. It boxes you in. Instead, create your own power block with those engaged in “good” politics that align with your values. Focus on your circle of influence. Build your own power network with those that share your perspective and are attuned to your values. Look for those who play “good” politics. Recruit them into your circle of influence by offering them support, encouragement, information, input, feedback, resources and access to others in your network. Earn their trust and respect through positive deeds and actions. Building your network will take time and effort – start today! “Keep your friends close, your enemies closer.” Sun Tzu, the author of the Art of War, understood that you have to be able to think like your enemies if you want to defeat them. Don’t shut out those who practice “bad” politics – rather, engage them, try to understand their perspectives, and learn their patterns. The more you know about them, the better you can manage your relationship with them. Remember, it’s not personal. Sometimes this is really hard. “Bad” politics players usually randomly select who they attempt to bludgeon based on who is directly in front of them. If not you, then someone else – you are all the same; you are all the enemy. So, stay detached, don’t let your emotions dictate your actions, find support in your network, stay positive – and, focus on delivering positive results. Think and look for “Win-Win” solutions. When you engage in win-lose situations, you create enemies. Often these enemies have long memories and work behind the scenes to undermine you. Either crush them (beyond repair) or find a solution where no enemy is created in the first place. Usually, you can find creative “win-win” solutions to most situations. Consult your core values for they are your “north-star.” When in doubt, go back to your principles. Does this person or action fit within my core values? If the answer is no, then you need to reconsider your path going forward. Expect betrayal. Sometimes the people you trust get lost in “bad” politics and they turn against you. Be careful whom you trust in the office – or better yet, trust very few. Corporate politics is an ugly game often played by those whose only objective is complete victory. As project managers, we have to recognize those who engage in bad politics, protect ourselves and our teams, and steer clear of situations where we might violate our core values. What do you think? What are your suggestions for handling politics in an organization? Do you see all politics as bad? I am interested in your feedback. This entry was posted in Development, Project Management and tagged Corporate Politics, politics, Project Management, project managers, project sponsors, projects, sun tzu, win-win. Bookmark the permalink. Love the emphasis on “Good” politics – agree that project managers really need to understand politics in order to analyze behaviors that may not make sense! I like to believe that the best way to handle politics in an organization is to refuse to play the game. Be authentic, be real, be POSITIVE (i.e. Good politics), and hopefully you will help lead others in the right direction! Great article Dale! 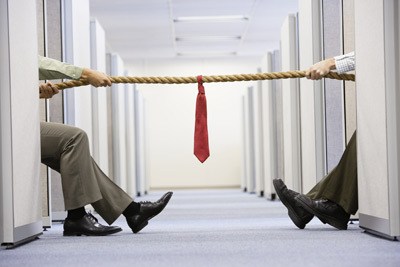 It’s strange, I always thought I would never get office politics, when I was first starting out in the Corporate world. Since then, experience has been my best teacher. I can now almost immediately gauge someone’s motivation (i.e. practicing good politics versus bad versus neutral versus not having a clue), by there body language, tone of voice (over the phone), or through the wonderful grapevine. As a PM, we have to deeply engage with many members of various teams to assess their positions and plan and react accordingly, to do what is in the best interest of the project as a whole. The article has effectively documented realities of corporate world. Whether the Project Manager wishes or not, they will be sucked into the system by either of the factions for personal agendas. The catch here for the Project Manager is to be “participative” but remain aloof of the “political atmosphere” that prevails. Difficult task, but can be mastered by involving in these corporate political games without attachment. In case the Project Manager chooses to stay on the sidelines, they will be overrun, kept in the dark and will face surprises at every stage of their functioning. Others are working with defining organizations and helping Managements with decision making process. Recognizing bad politic within cooperates is a part of success. One also needs to be able to manipulate resources in order to achieve goals. I realize words like Manipulation are negative. However if it is used correctly then it simply makes you a better Manager. I am sorry but I do not agree!! It is very personal. Result of successful Bad Politics is failure of the project, as project manager I see this as personal. Thank you Sean for taking the time to read and comment. It’s very hard not to take it as being personal. I understand this and have experienced it myself. We are all sensitive to what happens around us and often take it personally when someone challenges us. My point is that to overcome these situations – we need to keep our emotions in check, think logically, act rationally, and not let others dictate our actions. This can be really hard – but, it is important. We have to rise above the situation and move forward in a well-thought-out manner. I thank you again for your comments. All the best. Very good PM strategy consideration sample. Thanks. Thanks Dale this will really come in handy because in our organisation office politics has taken a life of its own to a point all the good ones are walking out. in the end we are only human and there is only so much one can take. ill try to stand my ground and dodge all the negativity and just concentrate on my work. Laurence – thank you for reading, commenting and sharing this post. This topic is not really well covered in literature which is one of the reasons I wanted to write about it. Check to see what you can find from John Eldred who is/was an MBA Professor at the University of Pennsylvania. He taught a course on this subject and has some interesting thoughts. Corporate politics is hard to define and very difficult to model – hence, the lack of academic/consulting type studies. Perhaps within you group setting time each month/or quarter to discuss the topic with your team will help. Maybe as a team you can help each other deal with the realities of politics. Please let me know if you find any good literature sources on this subject. Good luck! Thanks again.